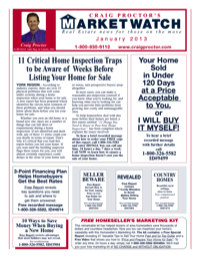 The articles are already written and have been proven effective by Craig Proctor and real agents in markets all over North America. You will receive proof within 48 hours of submitting all necessary information. A new MarketWatch Newsletter will be prepared for you every month - making it easy for you to maintain regular and automatic contact with your prospects.